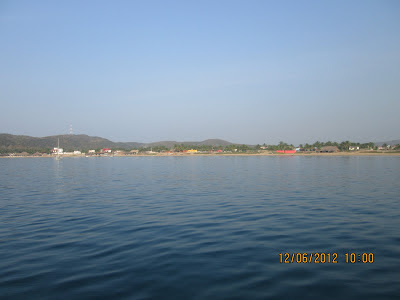 We are anchored in Manzanillo right off of the Las Hadas resort. We are growing a bit weary of sharing the anchorage with jet skis and water skiers. Fortunately, we have nearly survived Christmas week in Mexico and hopefully the festivities will taper off soon. When we decided to try living aboard we agreed we would try it for a year and see how it went. 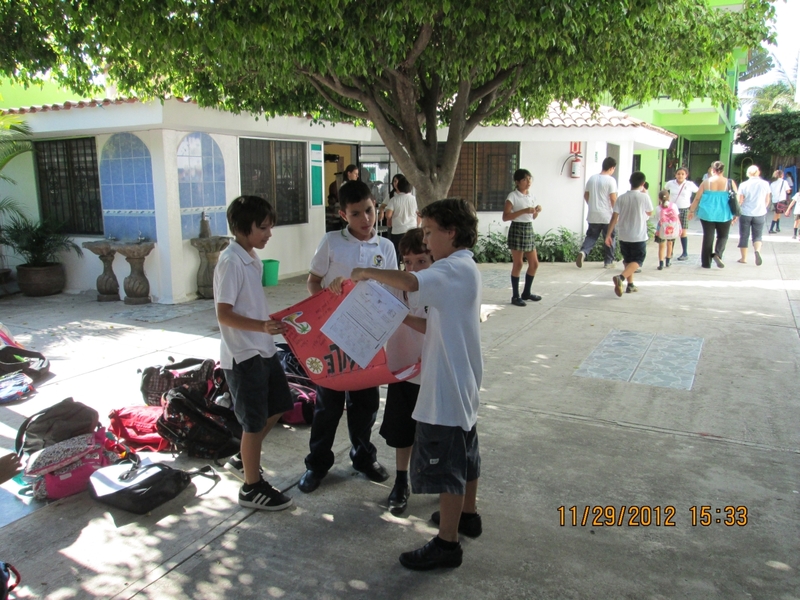 We also agreed that we would cruise the Mexican Riviera and then decide what to do next. 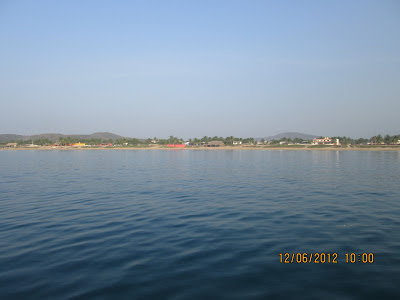 We have been aboard for more than a year now and are in Manzanillo at the end of the Mexican Riviera. We have been at anchor for the past month and have enjoyed it. Now it is time to consider what to do from here. As far as life aboard, we have all enjoyed it. Christina does get frustrated with our small living space and with the small galley. She says that many of the cruising women she knows wish for a stable floor. Christina still has angst about not being a productive, wage earning member of society. I look at it a bit differently and suggest that she misses being a cog in the machine. Don’t get me wrong, we have really enjoyed living aboard but Christina wants to feel more relevant. Someone told me that there are blue jobs and pink jobs on a boat. As you can imagine Christina chafes at this. The problem is it really does turn out that I do the blue jobs and a few of the pink jobs with Christina doing most of the pink jobs. Remember, we don’t have a dishwasher. At times it is like a time machine has transported us back to the 1950’s. Spending so much time on cooking and cleaning, the pink jobs, leaves her feeling less than fulfilled. Her father used to call this ”squaw work” and it always stings a bit. Christina’s biggest challenges are the isolation of so much time on the boat with two other human beings and home schooling Kyle. While for the most part she likes the homeschooling, she would prefer to be a productive member of society with the education of our son handled by professionals. Whenever the topic of what to do next comes up, Kyle wants to go home to see his dog, Truck. Or he lobbies to have Truck come and live with us on the boat or on land – wherever that may be. 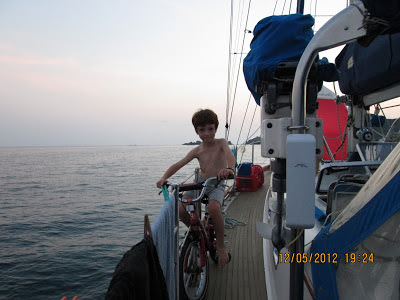 In between his homesickness for Truck, Kyle is really enjoying life aboard. Of course, Ken really likes living aboard. La Cruz might work for a while. However it was really hot there last summer and it’s hard to say if Christina would do it for another summer. Hmmm. 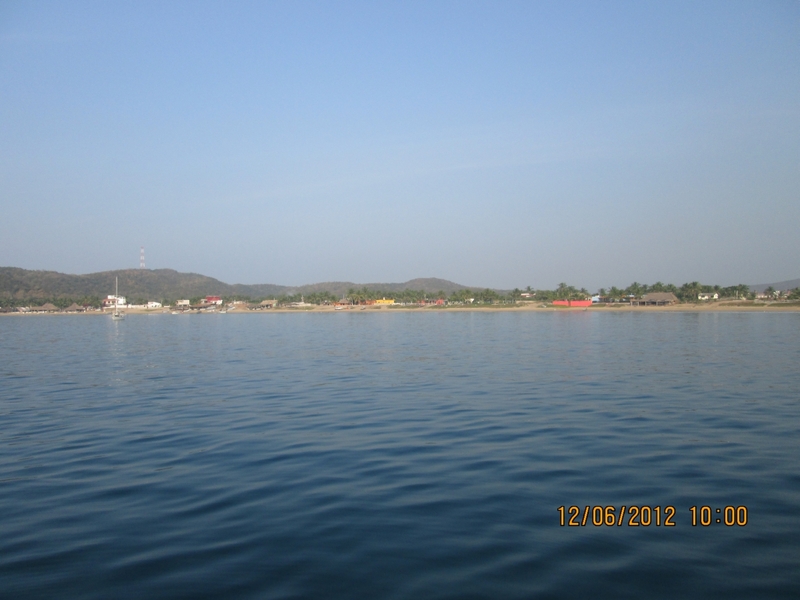 Manzanillo is the end of the easy cruising, the end of the milk run. South of here there are few anchorages and the ones that do exist are not protected and are open to the Pacific swell. Mostly cruisers hop from one harbor to another. From here, our next passage would be 142 nm to Zihuatanejo. We should plan for two days and nights. After that it is 112 nm to Acapulco, then another 342 nm to Huatulco. 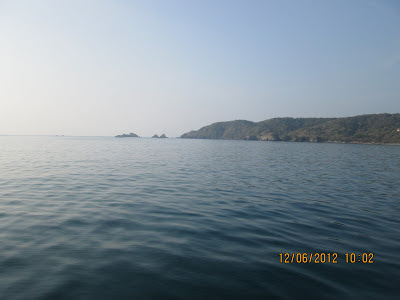 We would like to see Zihuatanejo and Huatulco but are not very interested in Acapulco. So, it is about 500 nm to see two more places. 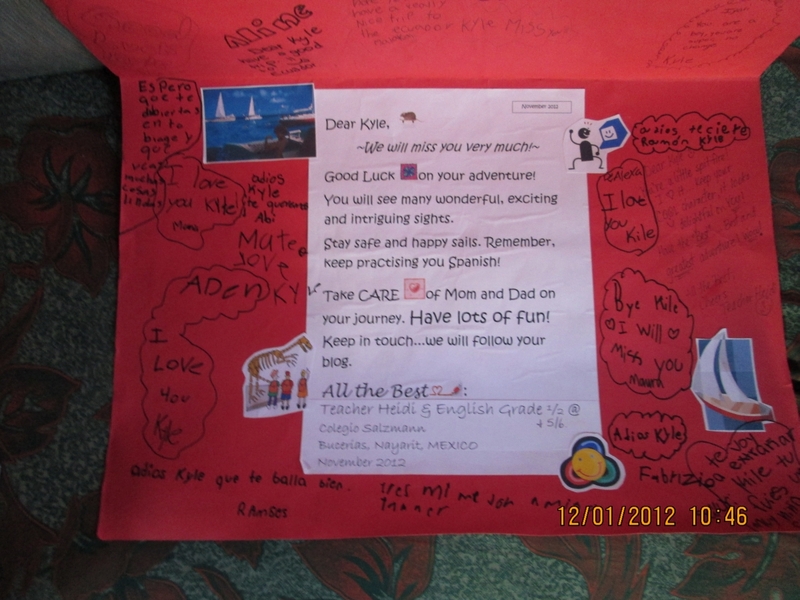 We really want to see Ecuador. We recently met Robert and Virginia on Harmony at Tenecatita. They had been to Ecuador some years ago. They had a rough go of the Tehuantepec and the Papagallos. Robert’s advice was to stay in this area and enjoy the Mexican Riviera-the Costa Allegre. He said it does not get any better than this. If we head south, after Huatulco we would come to the infamously windy Gulf of Tehuantepec where winds are often gale force. It is about 250 nm across the Gulf. Cruisers wait for a weather window in Huatulco and then stay a few hundred yards offshore of the breaking surf at about ¼ nm off the coast in 30 to 40 feet of water for 250 nm. For us this is a good two days of sailing or motoring close to shore. The idea is that if an unpredicted wind does kick up you don’t have much fetch to build waves. The Tehuantepec can breed really big, short, steep waves. Hmmm… Yes, it gives us pause. After the Tehuantepec come the Papagallos, ferocious winds that can be present from El Salvador through the northern part of Costa Rica. Apparently, they can blow up without warning. Robert said he sailed in 50 knot winds with one hand on the sheet (ready to let it go) for two days. He did not have a good time. Of course, we knew of these hazards before we left La Cruz, but now we are here trying to decide what to do next. 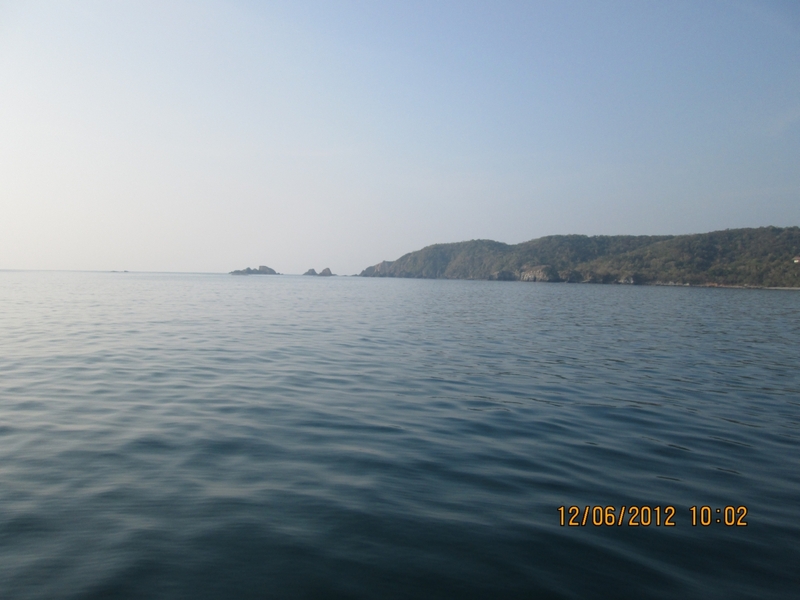 Other considerations- We especially want to see Huatulco. 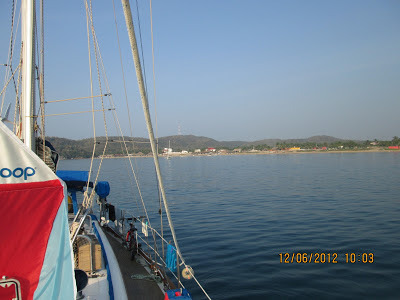 We would like to spend some time at anchor in Costa Rica and in the Panamanian islands. However, our real motivation for going south was to spend time in Ecuador. On the other hand, Ecuador is not a real cruising destination. The coast of Ecuador does not have a lot of draw for cruisers. So, is it the best place to take Sea Biscuit? Should we travel to Ecuador by plane sometime in the future instead of by boat? If we love Ecuador and want to settle there, then we would have to sail the boat back to North America to sell Sea Biscuit. Going back the winds and current are against us. Are we up to that much more travelling, some of it quite challenging? Travel North or travel South – that’s what is on our minds. Do we stay and enjoy the Mexican Riviera or go for the gusto? What are our alternatives? Return to New Mexico? I don’t think we’re ready to do that. 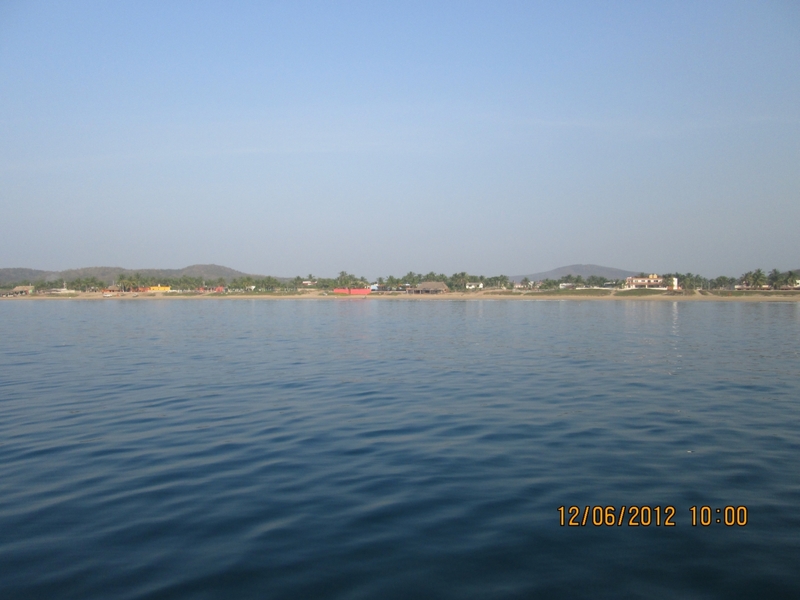 Return to La Cruz for a while? We really enjoyed La Cruz. It is not a bad place to go back to. Kyle really liked his school there. There is a “Comments” section below if you have any words of wisdom to share. Now that Kyle is busy with homeschooling I am once again amazed at how much patience and work goes into teaching kids. Kyle's teachers at Colegio Salzmann did a wonderful job. He is doing well in English, he knows his math, his penmanship is greatly improved, his Spanish is better and better. His English teacher, Teacher Heidi, was his favorite. 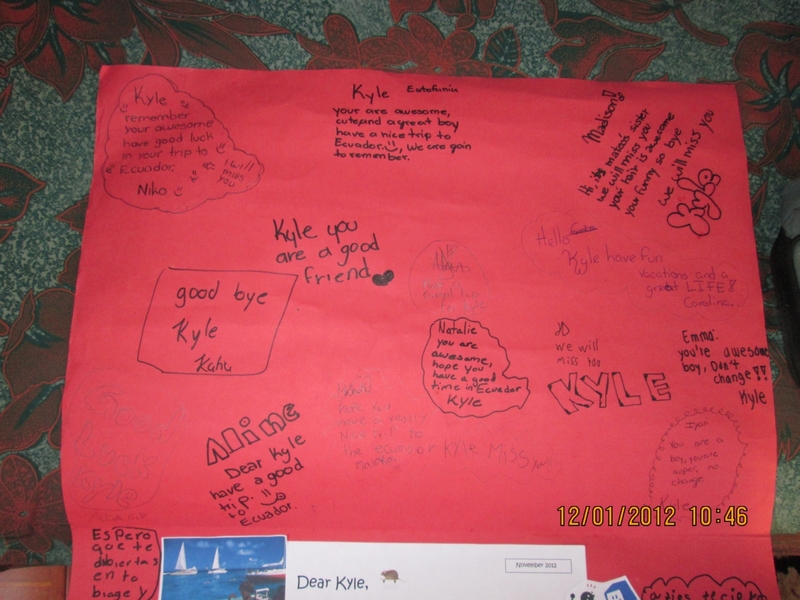 She and the class created a huge Bon Voyage card for Kyle before he left. 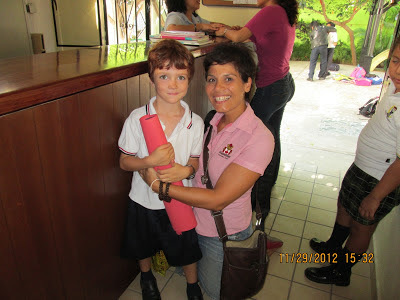 His science and environment teacher, Maestra Celina, did an excellent job keeping him interested in the world around us. Kyle enjoyed Art and Music class with his teacher, Edgar (outside of school we had fun listening to Edgar play his guitar at Philo's). 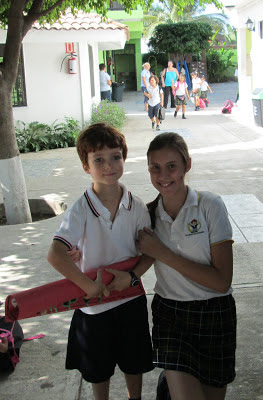 Kyle also found out that Maestra Yadira, his Spanish teacher, was one of the nicest teachers in the whole school. He even started to like French toward the end. 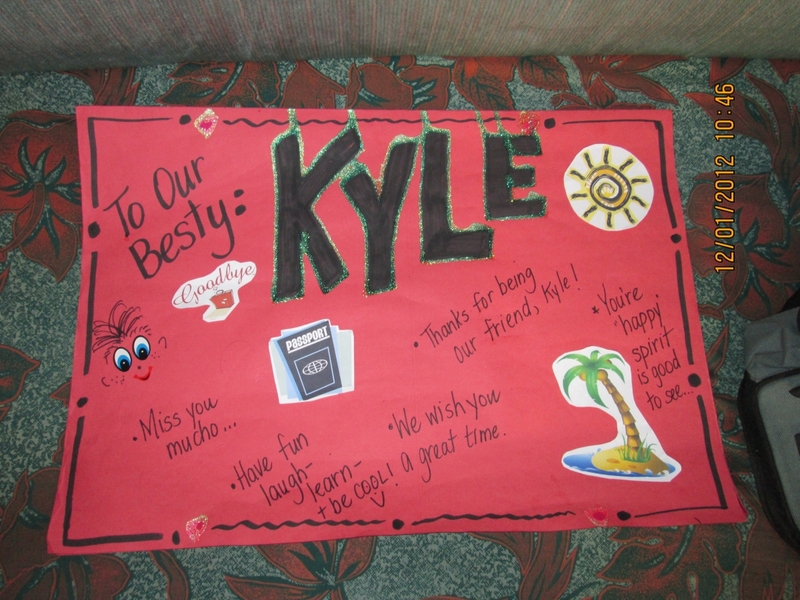 Kyle had quite a few different teachers, so those I didn't mention, please know we appreciate each of your efforts. Muchas Gracias! 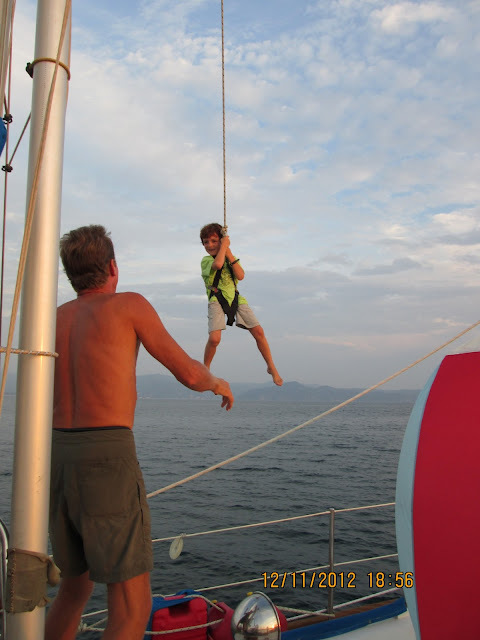 A quick post - This last summer we bought Kyle a full harness so he could swing from the halyards. 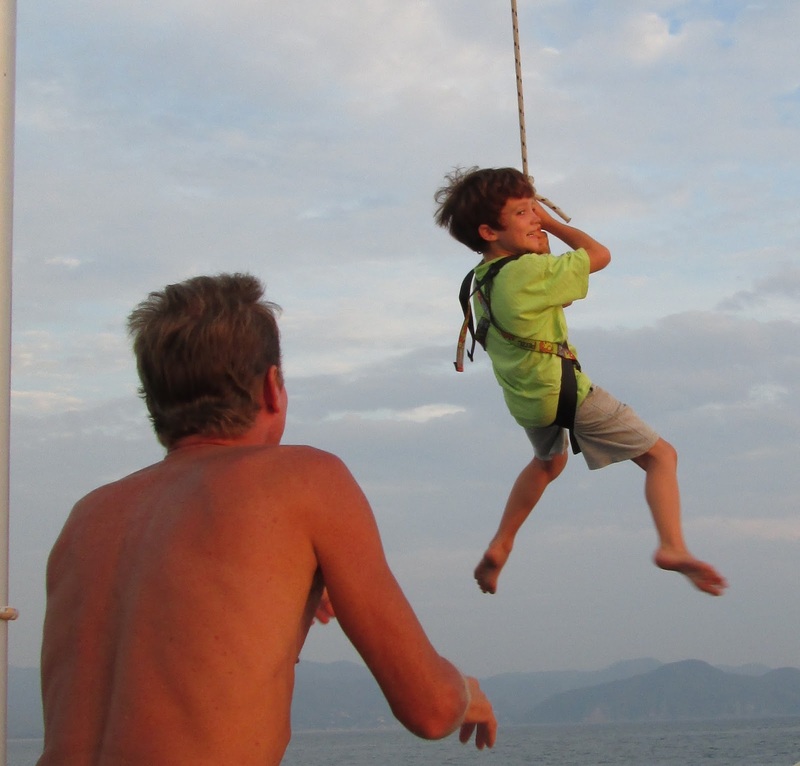 I had read about the kids on a boat named Kamaya having fun swinging from a rope attached to the mast of their boat and thought we should give it a try. Up until recently Kyle didn't seem very interested in the whole idea and had a healthy fear of going up the mast. But two days ago he decided he'd try it and now he's hooked. He wants his homeschooling to include three sessions of PE per day with swinging as the main attraction. Note - Luckily he doesn't want to go all the way to the top of the mast.